Circumstances: On 8 October 1970, Hazel Pope picked up her work colleague, Joyce EASTWOOD, from home, along with her two sons to attend their place of employment (Noarlunga Meat works). The boys were dropped off at the gate whilst Hazel parked the car. There was a security guard on duty at the gate and he stated that the woman arrived at the meatworks between 07.00am – 08.00am where they unloaded two suitcases and were almost immediately both collected by a male taxi driver and drove off, leaving the car (mini minor) in the car park. It is believed that the women both handed in the resignations about a week prior to leaving. No contact has ever been received from any members of the families. JOYCE Eastwood and Hazel Pope were the best of friends. Arriving from the UK in 1968, they worked together, socialised together and their 11 children happily grew up together. Then, in 1970, the Adelaide residents turned their backs on their new lives, running away together. Their decision to leave led to their families' eventual disintegration. It also has left their surviving children looking for answers, 35 years later. 1991) and their six children arrived in Perth on a ship. Hazel, her husband Andrew and their five children arrived there on a plane in the same year. Both families lived in an immigration hostel at Fremantle for a year until moving to Koolyanobbing, in WA's goldfields northeast of Perth, where Mr Eastwood and Mr Pope worked in a mine. they vanished on October 8, 1970. On that day, the pair arrived for work in Mrs Pope's green Morris Minor and unloaded two suitcases. A security guard said a taxi picked them up. Police discovered the pair had resigned a week before disappearing and Mrs Pope had withdrawn $3400 from a joint bank account. The only lead came weeks later, when Mr Eastwood received an account from a shop in Perth requesting payment for goods bought in the name of one of the women. Major Crime Investigation Section detectives have said while there was no evidence of foul play, it would "provide some relief for their children to know why they took this action and where they are now". 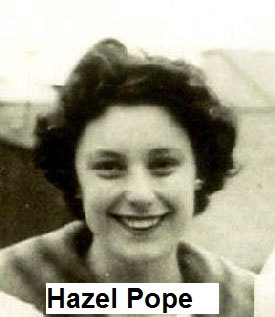 * Hazel Pope and Joyce Eastwood migrated from England with their families in 1968. * Both families lived in Western Australia before moving to South Australia. * The two women worked together at the Noarlunga meatworks until the week before they both vanished. * They arrived at the meatworks on the morning of October 8, 1970, got into a taxi and then turned their backs on their young children and families, never to be seen again.